According to regulatory disclosures recently filed by the company, Bausch & Lomb has now been named as a Defendant in 573 product liability lawsuits involving the now permanently withdrawn ReNu® with MoistureLoc® Multi-Purpose Solution. Most of these cases were filed in various state and federal courts throughout the United States by individual contact lens-wearers who suffered eye infections after using the defective ReNu with MoistureLoc product. Reportedly, 308 of these lawsuits are now consolidated before one judge, the Honorable Shirley Kornreich, with the Supreme Court of New York, New York County. Most of the state court cases were filed in New York because that is where the office headquarters of Bausch & Lomb is located. More than 200 federal cases have now been consolidated before one federal court in Charleston, S.C. as part of a federal procedure known as “Multi-District Litigation” (MDL). The presiding judge currently handling all federal cases with the MDL is the Honorable David C. Norton, District of South Carolina, Charleston Division. Judge Norton will oversee all discovery and other pretrial matters of the federal cases which, as of August 14, 2006, are consolidated as In Re Bausch & Lomb, Inc. Contact Solution Products Liability Litigation, MDL 1785. In part, the federal cases were consolidated in the U.S. District Court in South Carolina because the manufacturing facilities where the ReNu with MoistureLoc product was made and distributed are located in Greenville, S.C. Some analysts have estimated that Bausch & Lomb could face potential liabilities in the ReNu product liability cases of $1 billion or more. 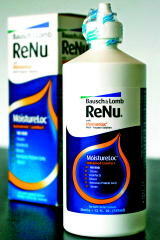 In May 2006, Bausch & Lomb permanently withdrew its ReNu with Moisture Loc product from all U.S. and global markets. Products liability attorney Daniel Ragland is currently handling one of the federal cases which was consolidated within the MDL located in Charleston, South Carolina. That lawsuit, Patricia Fuller v. Bausch & Lomb, Inc, was initially filed in the U.S. District Court, N.D. Ga, Atlanta Division, on July 16, 2007. Ragland Law Firm, LLP Files Lawsuit in an Atlanta Federal Court Against Bausch & Lomb on Behalf of a Woman Who Contracted a Fusarium Kerotitis Infection after Using the Company’s ReNu with Moisture Loc Product. There are over 30 million users of contact lenses in the United States, and by 2006, about 2.3 million of them reportedly used the ReNu with MoistureLoc product to clean, sterilize and/or store their lenses. Beginning in April 2006, with a case filed in federal court in Miami, dozens of meritorious product liability lawsuits have already been filed by consumers claiming that Bausch & Lomb failed to adequately test the product prior to starting sales in 2004. More importantly, these lawsuits claim that the ReNu with MoistureLoc product is defective and that Bausch & Lomb failed to timely warn U.S. consumers of the risks of Fusarium Keratitis despite significant evidence of a link between use of ReNu with MoistureLoc and a dramatic rise in the incidence of these fungal eye infections. Punitive damages are sought in many of these cases on grounds that Bausch & Lomb acted recklessly in concealing information from the FDA and consuming public, and acting much too slowly to protect consumers by delaying in its initial recall and subsequent withdrawal of the product.